In the jungle highlands of Borneo, close to the modern border between the Malaysian state of Sarawak and the Indonesian territory of Kalimantan, the Kelabit people have always lived remote from the rest of the world. Their isolated plateau is high above the headwaters of the river system which is home to the rest of Sarawak’s indigenous people, and accessible only by several days’ trek through hazardous mountain passes. Their natural resources – particularly the succulent rice for which they remain famous, and the iodine-rich salt wells scattered across the plateau – made them comfortably self-sufficient. The first they knew of the modern world was in 1944, when a US Liberator bomber roared low over their plateau, and a gung-ho British anthropologist named Tom Harrisson descended by parachute into a world of hanging mist and thick, boggy sedge. Harrisson was on a top secret mission of his own devising, which had taken months to sell to his superiors. His plan was to infiltrate the hill tribes of the Borneo highlands and co-opt them into the Allied resistance against the Japanese who had seized control of the Sarawak coast. But he had also landed in an anthropologist’s paradise, a pristine culture whose intricate web of myth, ritual and belief stretched back unbroken to antiquity. Like the better-known tribes in the rivers below, the Kelabits lived communally in longhouses, built on stilts; they kept the bones of their ancestors in ancient ceramic jars that expressed their family’s status and identity; their young men would periodically hunt the heads of neighbouring tribes as trophies to win potential brides. But one aspect of their culture was conspicuous and unique: they erected megaliths. Their plateau was studded with artfully arranged standing stones, huge boulders carved with cryptic symbols, and ceremonial trenches dug across river valleys in commemoration of their ancestors. The Kelabits’ was a culture without writing but, like the tattoos across their bodies, each of these transformations of the landscape told a story. Through them the living kept company with the dead, as they went about their daily life through a land etched with their memories. This was a practice that dated back to time immemorial, but it would only survive Harrisson’s visit by a couple of years. His mission brought the Kelabits into close contact with their previously distant neighbours, with whom they co-operated in disrupting Japanese troop and supply lines. It also introduced them to modernity, represented by shoes, parachute cloth and – their particular favourite – sub-machine guns. 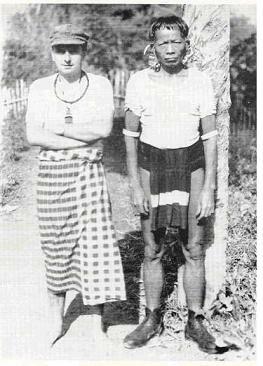 With the Japanese surrender and the end of the war, the rest of the modern world arrived in the form of traders and missionaries, and the Kelabits’ traditional animist beliefs were rapidly supplanted by Anglican Christianity. Over the intervening sixty years, the megaliths have been largely forgotten, swallowed up by the jungle that claims all untended ground in a matter of weeks and by a Christian faith that regards the animist past as a ‘time of darkness’. But there are still members of the older generation who grew up during this time, and who have vivid recollections of the ceremonial and ritual world that the megaliths represent – and at least one who has very clear memories of participating in a megalith-building ceremony himself. Over a series of evenings in Pa Umor longhouse, its communal hall dimly firelit by the dozens of family hearths along its length, the village head man, Tama Pasang, is glad to tell his story. 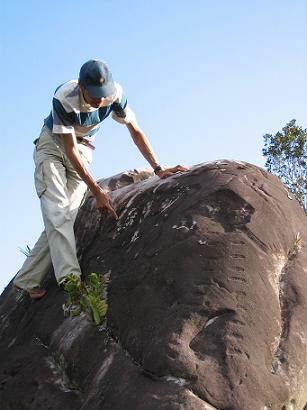 Tama Pasang was aged somewhere between fifteen and twenty when his father died; although the modern calendar was not yet in use among the Kelabits, the date must have been 1945, as his father died a couple of months after the end of the war and his megalith was one of the last to be erected in the traditional manner. The ceremony took place as part of an irau, the elaborate funeral feast held to commemorate his father’s death. The irau was a central plank of pre-Christian Kelabit life, to which a network of extended families and in-laws would be invited from longhouses all across the plateau. It was one of the few occasions on which the wider Kelabit community would mingle, and the best chance for young men and girls to meet potential marriage partners from far-flung villages. In-laws would be reunited, grievances would be aired and settled, gifts would be exchanged and the wheels of Kelabit society would be oiled. 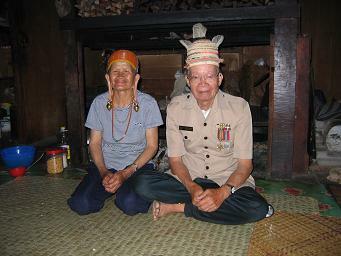 The host family would spend weeks preparing for the festivities, and the lavishness of the feast they supplied would reflect and determine their social status: it would include rice, buffalo and, crucially, borak, a freshly fermented rice wine prohibited by the Christian missionaries but still recalled with lip-smacking fondness by the older generation. The irau would last for several days and sleepless nights of prodigious eating and intoxication, borak topped up after every sip and rice flung at all the guests to symbolise abundance and conspicuous consumption. And sometimes, though by no means always, at some point in the proceedings a megalith expedition would be proposed. Stone was, and remains, a magically charged substance for the Kelabits. Their plateau is alluvial, composed of mud and silt, and stones are rarely found except in the beds of rivers, where they are carried down from the mountains above. There are isolated boulders scattered across the plain, their locations well known and notoriously spirit-haunted. Many of these boulders have been carved with symbols whose meanings are now forgotten, but are believed to commemorate the dead of distant and forgotten times. Some feature stylised faces, often with a series of lines beneath them (according to some, the number of heads taken by the ancestor during his lifetime); others depict totem animals such as hornbills. Because these boulders are so conspicuous and so rare, they may have been claimed by powerful ‘big men’ or chiefs for their own funeral ceremonies while they were still alive. By the same token, any unmarked stone lying in the jungle, even far distant from human habitation, would have been noticed by many people over the years, and might be remembered around the time of an irau to commemorate a great chief. When Tama Pasang’s father died, his family gathered together to choose the date for his irau. Once they had done so, they summoned a renowned spirit-caller, who mediated with the dead, from a longhouse some distance away. To determine whether the date was propitious, the spirit-caller in turn summoned an eagle, which flew high in the right direction: if it had flown low, or in an inauspicious direction, the date would have needed to be changed. Now, the long preparation began: Tama Pasang’s sister recalls pounding rice for weeks on end, enough to feed two hundred people for the six days of the irau. During these preparations, the family conceived the idea of erecting a megalith to commemorate their father, and recalled a suitable stone that had been seen in a far distant place many years before. Once the guests had arrived from villages far to the north and south, and the borak was flowing freely, the family proposed the idea of a megalith; the guests acknowledged the dead man’s right to such a monument and accepted the challenge. A group of men, including the young Tama Pasang, made the trek into the deep forest to find the stone. Lifting and carrying it was heavy work in the dripping heat: it took eight men at a time to support it between two poles carried on their shoulders, and even so they could only take the strain for a short distance. They hauled it in shifts, keeping their energy up with singing, and with more borak. When the men struggled back to the longhouse with the megalith, they set it on its end in a spot that had been agreed: on the trail between the old longhouse that had been recently abandoned and the new one, a trail the dead man had walked thousands of times and one where the stone would be passed by and remembered. 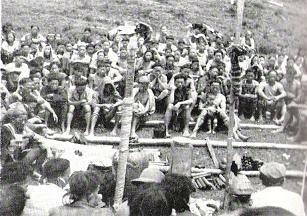 The men rejoined the irau, and the party continued for several more days. When they left, each of the guests was given a bag of rice, a carved bamboo tube full of salt, and a specially made parang knife. 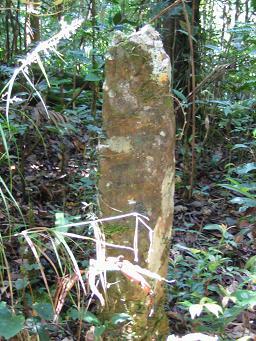 The site of Tama Pasang’s megalith may have been conspicuous in 1945, but today it is in a remote part of the forest only occasionally visited by hunters, the old trail crawling with leeches and overgrown with razor-sharp rattan cane. It leads past another striking funeral monument: a ditch, waist-deep, that runs across a dark, forested valley for several hundred yards. Tama Pasang and his wife both recall the digging of ditches like this, usually a full day’s work for the entire longhouse. Sometimes the landscape was altered in other ways, for example by straightening a swampy oxbow bend in a river. Such projects had no practical use: they were ceremonial and aesthetic, designed to be forever associated with the ancestor they honoured. The trail leads on, over rivers spanned by fallen trunks and past the rotting remains of the old longhouse, the jutting remnants of its timbers blanketed in creepers and orchids. 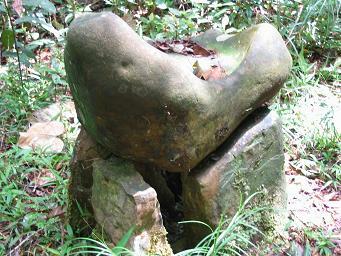 An hour or two further is a megalith of distinctive shape: a saddle-shaped stone perched on blocks in the form of a seat, and set in a jungle clearing beneath tall trees. The story behind this one is still remembered – it was erected a few years before Tama Pasang’s, by a neighbouring family. To this day, though, no-one would tempt fate by sitting on it. Beyond this point, the last hunter’s trail peters out, and the jungle falls silent, dank and gloomy. The ground becomes a morass of rotting tree-trunks and mud, criss-crossed by the prints of sambal, mouse deer and wild boar, and with ants’ nests dug open by bears. We find ourselves moving in circles, crossing our own path, scrambling up and down slopes that may be the eroded banks of forgotten ceremonial ditches. Eventually we stumble on Tama Pasang’s megalith. It stands exactly as he had recalled it, in a dip between two hillocks, a mute but eloquent confirmation of a story that will soon outlive its last human witnesses. Now, though, it also has a practical dimension, serving us as a signpost back to the faint remnants of the old trail. It has been a decade at least since anyone visited Tama Pasang’s old megalith, but its rediscovery may be of more than sentimental value. The deep jungle in which it lies is now under threat: marked up on government and logging companies’ maps, and targeted for ‘development’. The logging interests that have worked their way through much of Sarawak’s primary forest are moving ever closer towards the Kelabit highlands, which is not only rich in primary forest hardwoods but offers access to the lucrative illegal logging just across the Indonesian border in Kalimantan. It seems that the Kelabits’ best legal defence against this incursion may lie in the megaliths and funeral earthworks with which they adorned their landscape over so many centuries. The destruction of religious sites is prohibited under Malaysian law; as more megaliths are remembered and unearthed, they may form a defensive ring around the plateau that will protect the Kelabits’ homeland from environmental destruction. These exuberantly strange structures, whose language is becoming tantalisingly lost to the past, may turn out to protect those who built them in ways they could never have foreseen. The Kelabits are glad to receive visitors and there is currently much interest in rediscovering lost megaliths to boost their campaign against the logging companies. Assistance is welcome, especially with hand-held GPS surveying devices that can be used to log the locations of megaliths accurately. The Kelabit highlands can only be reached by air, but there are now regular Twin Otter propellor-plane flights to an airstrip at the Kelabit village of Bario from the cities on the Sarawak coast. Several lodges offer cheap and basic accomodation. A recommended guide and host is Jamen Riboh, whose lodge is on the edge of Pa Umor village (gems_lodge@yahoo.com, when the Bario satellite link is functioning). Jamen has excellent English, unbeatable local knowledge, and a keen interest in megaliths, jungle magic and folklore.